Hans Andersen Brendekilde (1857–1942), A Sower on a Sunny Spring Day at Brendekilde Church (1914), oil on canvas, 49 x 76 cm, Private collection. Wikimedia Commons. 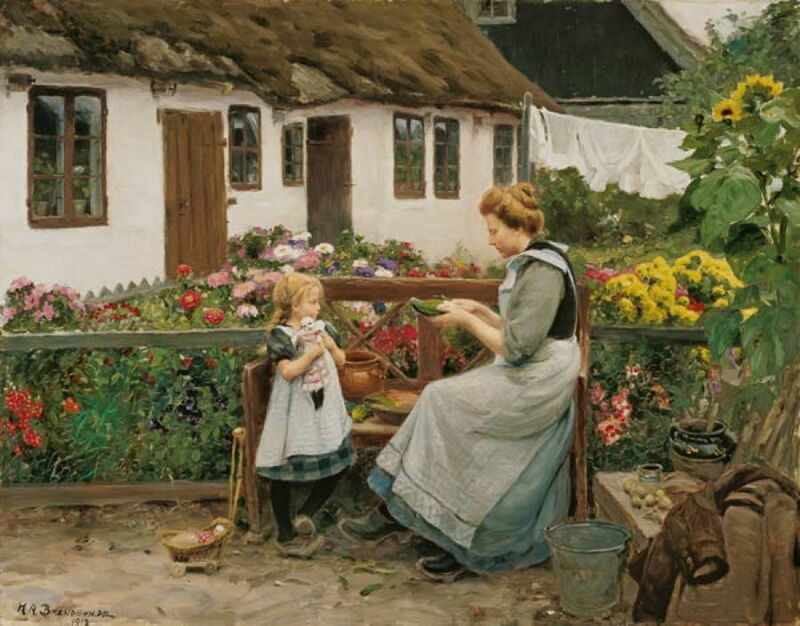 In the early twentieth century, Hans Andersen Brendekilde (1857–1942) was painting religious motifs and rather sentimental rural scenes. He was part of the art establishment too: like his long-standing friend LA Ring, he was on the permanent staff of the Charlottenburg Exhibition. In 1908-09, he visited Italy again, but I have been unable to find any of his paintings made outside Denmark over this period. Hans Andersen Brendekilde (1857–1942), Abel’s Offering (1908), oil on canvas, 196.8 x 360 cm, Dahesh Museum of Art, New York, NY. Wikimedia Commons. The sequel to his Cain gets on with his Work in the Field after Killing his Brother Abel from 1896 was over ten years in the making: Abel’s Offering, which he completed in 1908. His earlier work had shown the outcome, as Cain was burying the body of his murdered brother Abel. 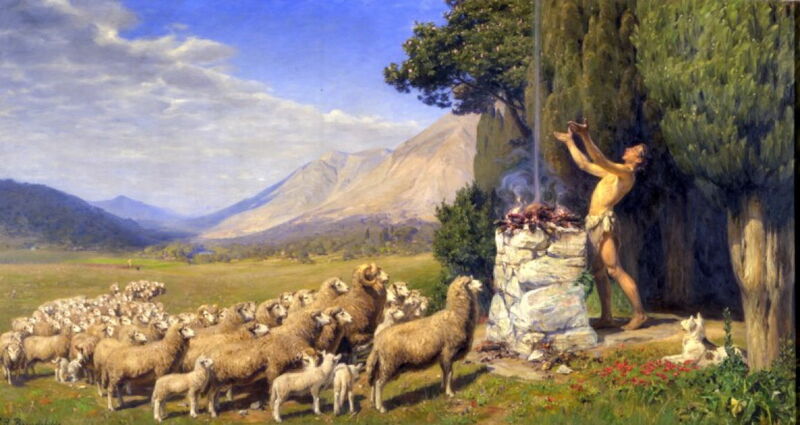 Here Brendekilde goes back to look at the cause of jealousy between the two brothers: Abel is making a burnt offering to God, his flock of sheep apparently joining him in worship. Cain was convinced that God responded more favourably to Abel’s offerings, which fired hatred of his brother. Hans Andersen Brendekilde (1857–1942), Farmhouse with Meadow Flowers (1909), oil on canvas, 48 x 70 cm, Private collection. Wikimedia Commons. Whereas Brendkilde’s social realist (Naturalist) paintings of the countryside had quite complex embedded narratives, in his later more idyllic rural works, there seems little more than the beauty of the view. 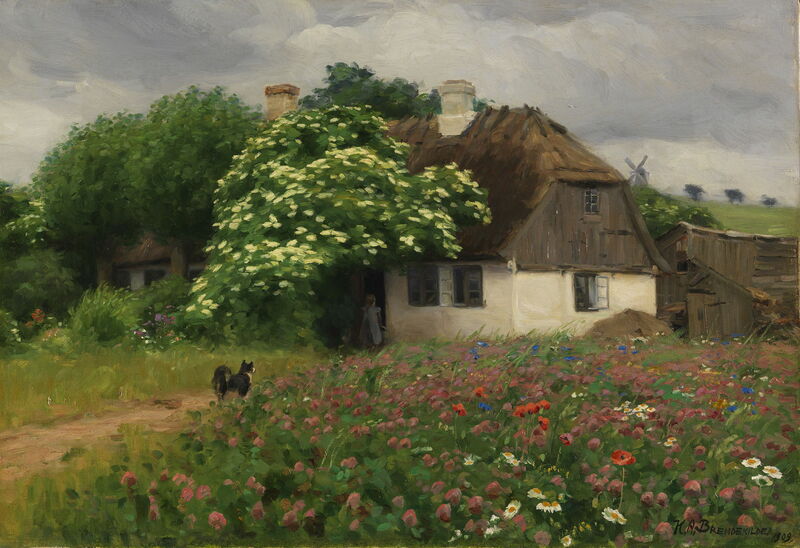 Farmhouse with Meadow Flowers from 1909 shows a tumbledown thatched cottage somewhere in the Danish countryside. A young girl is at the open door, and a farm dog stands watching from the path behind her. Brendkilde’s brushwork is looser now, giving a shimmer to the blossom on the tree in bloom. But the opportunity for social comment has been missed. Hans Andersen Brendekilde (1857–1942), Village Scene in the Early Spring (1911), oil on canvas, 62 x 84 cm, location not known. Wikimedia Commons. 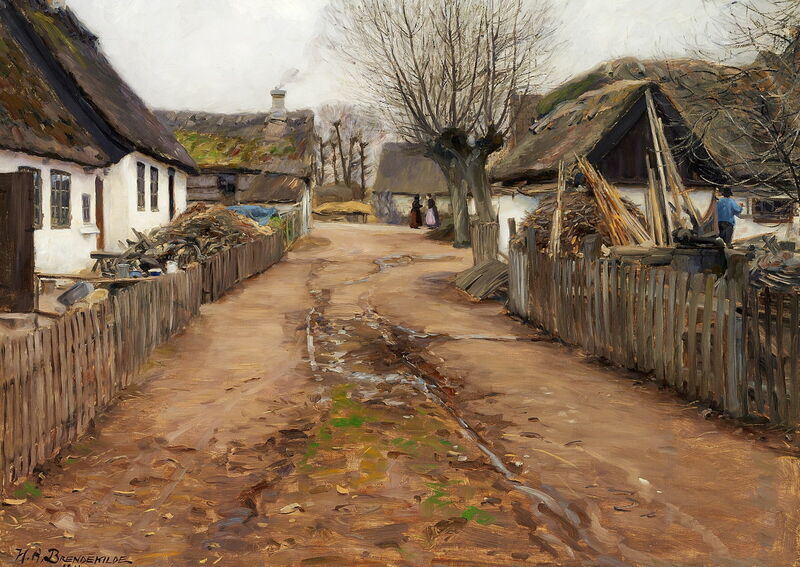 Peaceful acceptance also prevails in Brendekilde’s Village Scene in the Early Spring from 1911. The rutted mud track is slowly drying from its winter role as main drain. A man is out cleaning the tiny windows of his cottage, and two women have stopped to talk in the distance. Yet piles of wood and household junk sit in front of the cottage at the left. Smoke curls idly up from a chimney, and leafless pollards stand and wait for the season to progress. 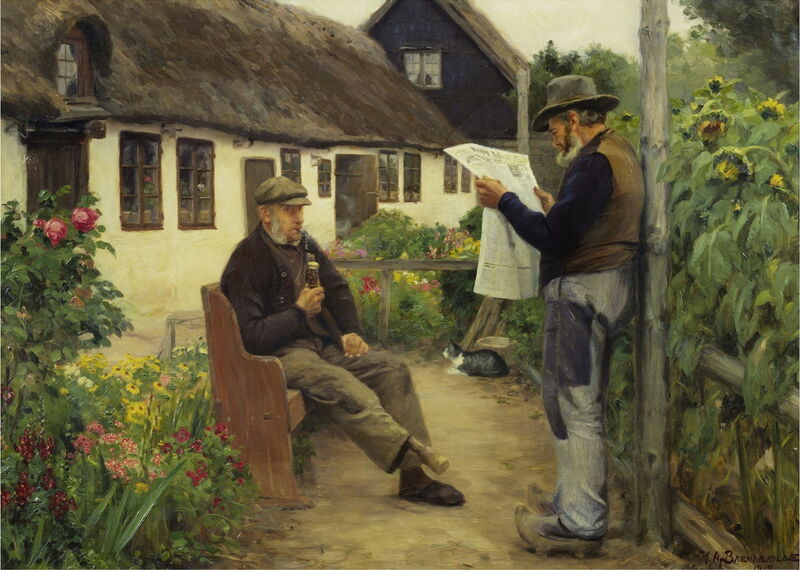 Hans Andersen Brendekilde (1857–1942), While Reading the Newspaper News (1912), oil on canvas, 61 x 85 cm, location not known. Wikimedia Commons. While Reading the Newspaper News from 1912 marks the steady passing of time without any real change. Two men are outside a thatched cottage in the summer. One stands reading a newspaper intently, in silence. The other sits drawing on his large and elaborate pipe, staring vacantly into space. It’s then that you notice that, unlike his friend who wears a pair of old wooden clogs, the man who is sitting only has one shoe: his right lower leg has been replaced with a crude wooden prosthesis, a ‘peg leg’. Hans Andersen Brendekilde (1857–1942), At the Garden Bank (1913), oil on canvas, further details not known. Wikimedia Commons. At the Garden Bank from 1913 shows different people in a different garden, also in summer. A young mother is preparing vegetables, cutting what appears to be a cucumber or courgette. Behind her are some small new potatoes on a wooden bench, a galvanised bucket, and a brown coat which looks oddly out of place. Her daughter stands in front, watching her mother intently and clutching a doll to her. Behind them are sheets hanging out to dry on the washing line, and a small flower garden in full bloom. In 1910, LA Ring had painted the figure of a sower casting seed on a ploughed field, a motif which had been developed during the nineteenth century by Millet (from his original version of 1850), Vincent van Gogh (1889), and others. Brendekilde responded in 1914 with A Sower on a Sunny Spring Day at Brendekilde Church. This is thought to show Holme-Olstrup Church, near Næstved on the island of Sjælland (Zealand), close to where Brendekilde was born and from where he had taken his name. 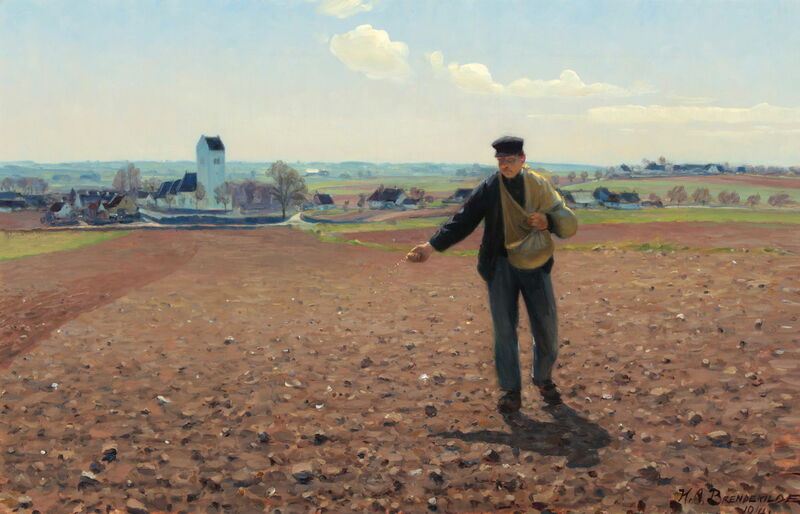 The sower, walking over poor soil with abundant stones, has been identified as Ole Frederik Jensen (1870-1953). Hans Andersen Brendekilde (1857–1942), Summer Day at the Beach with Boys Bathing and a Fisherman at his Boat (c 1900s), oil on canvas, 47 x 76 cm, location not known. Wikimedia Commons. 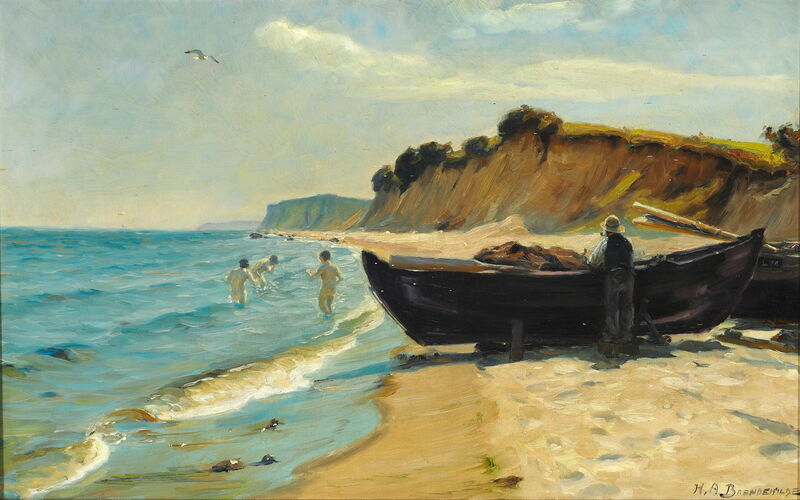 Brendekilde doesn’t seem to have had a summer retreat of his own, but at some stage during the early 1900s he painted this fine oil sketch of Summer Day at the Beach with Boys Bathing and a Fisherman at his Boat, which brings this chapter of his life and art to a conclusion. Tomorrow I will look at this period in the life and work of LA Ring, which is quite a contrast. Posted in General, Life, Painting and tagged Andersen, Brendekilde, Denmark, Millet, naturalism, painting, realism, Ring, van Gogh. Bookmark the permalink.